Can you imagine your grandma or elder loved one dreaming of going on a once-in-a-lifetime destination and having trouble getting up to the first step on the airplane that would take them to their dream vacation? They might change their mind and not want to go; you know how stubborn and independent they can be. And did you know that the smaller regional airlines are flying as many scheduled flights per year as the major airlines right now? But, sadly, some of these aircraft are going to airports that are too small to have a jet bridge accommodate them, so the passengers board and disembark the airplane via a stairway that folds out when the main aircraft door is opened. On some of these airplanes the first step up from the ground to that stair is 12 inches or more depending on the load of the aircraft. 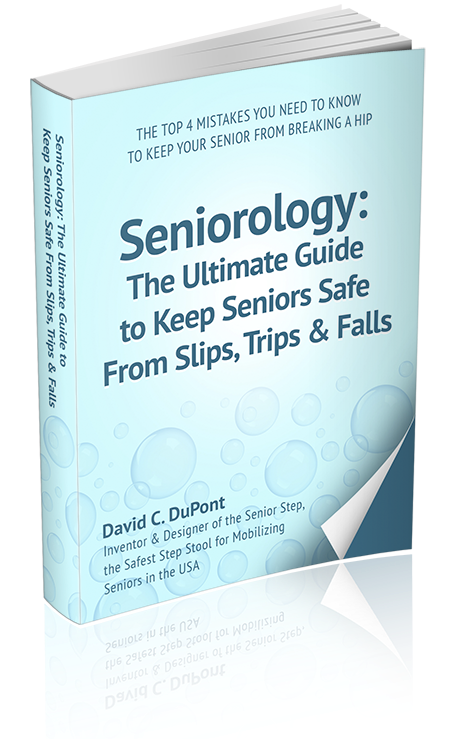 Seniors and physically handicapped need a safe, sturdy step stool on the ground to help them up to that first stairway step on the planes door. The physical shortcomings of a senior citizen should also be considered; Such as impaired visions. Thus, they need a step stool that is bright in color. A step stool with legs should be discouraged because they could accidentally put their foot under it and fall down. I’m sure no one would ever want this to happen to your beloved senior. Stable step stools with anti-slip steps are more likely our senior’s best friend in this situation. Make sure that your aircraft step has at least a 500 pound load rating permanently attached to the step so there will never be any doubt if it is strong enough to hold even the largest passenger wanting to fly to their dream destination. 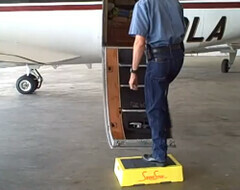 If your aircraft step stool has legs, it probably isn’t load rated for enough weight because legs tend to get bent, then the step stool will become unstable or wobbly. If you are flying in the winter to destinations where ice tends to cover the Tarmac, be sure that you keep your aircraft step stool secure on the ground by installing ice cleats on the bottom of the step for the winter months. 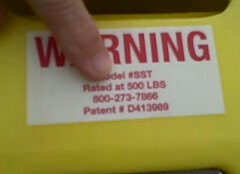 David C. DuPont had invented the safest Shure-Step step stool not for his own gratification but specifically to help people prevent unwanted accidents like he had done while using an unsafe milk crate to stand on. That incident pushed David to create a more stable, sturdy and safe step stool that anyone could use. 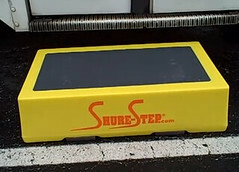 Shure-Step is a stackable safety step stool rated at 500 pounds that has many uses; Seniors, bariatric patients, physical therapists, rehabilitation facilities, bus, train, aircraft and transportation drivers, warehouse workers, mechanics, and technicians, even children benefit from the stability and strength of the Shure-Step. You can check it from here www.Shure-Step.com.